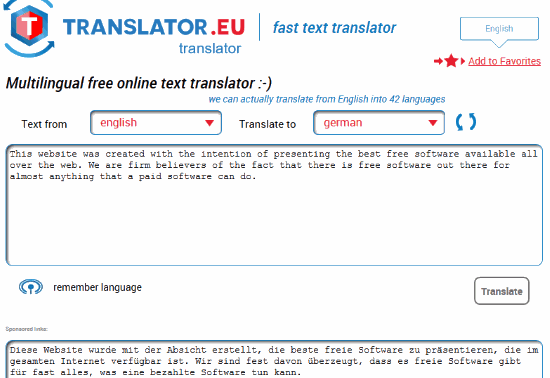 Here are 10 free online text translator websites. These sites are handy to translate text from English to some foreign languages like French, German, Hindi, Spanish, Bulgarian, Japanese, Korean, Polish, Thai, Arabic, Czech, Latin, Russian, and more. You can also add input text in some foreign language and get the output in English or other supported languages. When the translated text is generated, you can copy the translated text to Windows clipboard, share it using the sharing link, take a print (depending on the website), etc. Many of these online text translators have unique features also. For example, you can add Word file for translation, translate PDF, translate PPT, or other document for translation, save the translated text as PDF, DOCX, RTF, add URL of a webpage and translate that page, and more. Let’s check these free online text translator websites one by one. Google Translate is perhaps the best option for online text translation. Hundreds of languages are available for text translation. Just enter the input text and it will automatically detect the language. Or else, you can select the input language by yourself. You can also listen to the input and output text which is a special feature of it. Once the output is ready, you can copy it to the clipboard. The feature to share the translation via Email or Twitter is also there. 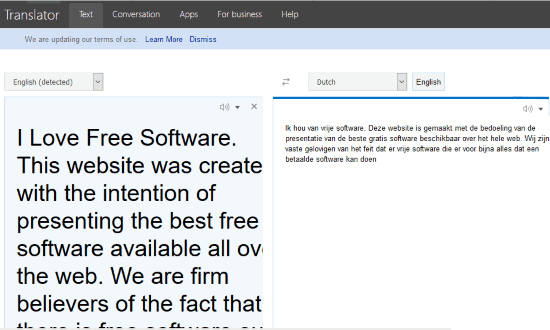 One more useful feature of this online text translation is you can add a document and translate it. It supports DOCX, PDF, DOC, TXT, RTF, ODF, PPTX, and other format documents for translation. The output for PDF translation was not as good as expected, but it was satisfactory for other documents. If you’re signed in with your Google account, you can also check translation history, save a translation, and view it later in Saved list. So, there are multiple benefits of using this text translator service. Bing Microsoft Translator (Homepage) is a great competitor to Google Translate and other online text translators covered here. It lets you add up to 5000 characters as input text and then translate it automatically. The text translation is done in real-time. It can also speak input and output text with a single click. A unique feature is also provided by this text translator. You can add URL of a webpage and it will convert it to the language selected by you. The feature to hover mouse cursor over a translated line to view the original text is also available that is pretty good. In addition to these, you can use other options. For example, you can suggest an edit, copy the output text, and share it on Twitter, Facebook, etc. 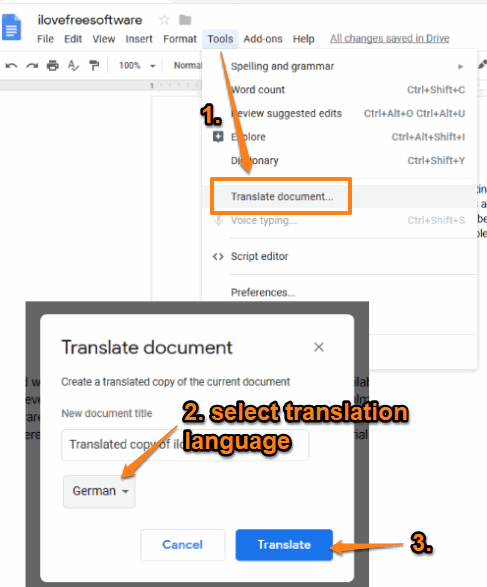 This might surprise you, but yes Google Docs has the feature to translate text or I say translate a document (having text content). There are multiple benefits of using Google Docs for text translation. Your text remains online in your Google Docs account which you can access anytime you want. Also, once the text is translated, you can save the translated text as RTF, DOCX, PDF, TXT, ePub file, etc., to your PC. Open a blank document and paste the text. Once it is done, click on Translate document option. It is available under the Tools menu. When a pop-up is opened, you can select the translation language, and press the Translate button. It will create a copy of your original text/document and provide the translated text in new tab. That’s it! The text translation is done, click the File menu and then use Download as option to save the translated text in any of the supported document formats. Systransoft.com comes with a very simple but useful text translation feature. Here is the link for its text translation page. Over 50 language pairs are supported for text translation. You can translate full text (limit is not mentioned), perform phrase translation, sentence, or message translation. Just Choose input language and output language, paste or write the text that you want to translate, and use the given button to get the output. Once you have the output, select it and copy it to the clipboard. There are no other features like listen to the text, share translated text, etc. 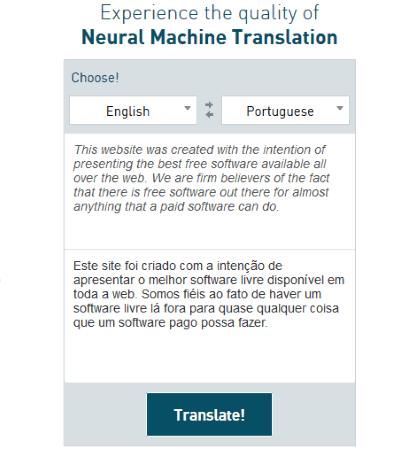 Online-translator.com (Homepage) gives a tough competition to other text translator websites. You can use this website with or without sign up for free. The only difference is without sign up, you can add 3000 characters for text translation, and with sign up you can translate 10000 characters at a time. It automatically detects the input text but you can also manually set the input language. After that, provide the output language and TRANSLATE. You can see original and translated text side by side. The features to copy translated text, share text by generating a link, print translated text, and suggest an edit for translated text are also available. It has easily reserved its place on this list because of all such features. 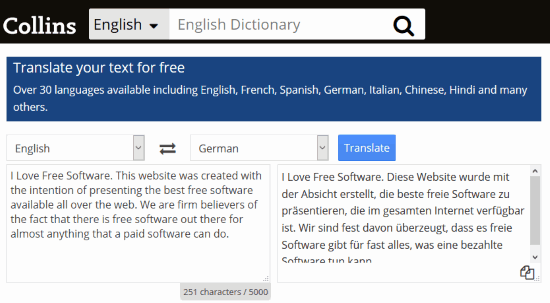 Translator.eu has a good looking interface where text translation is very simple. More than 40 languages are supported to translate original text to some other languages. The website also provides option to give rating to the translation, which can help others if the website is good for text translation. During my testing, the output came as expected. It uses Microsoft Translator for text translation so you will get good output. Collins Free Online Translator (Homepage) is also a nice option that you can try. 30+ languages are available for language translation. There are two boxes on its interface: one for input text and another one for output text. Set input and output languages, add the input text, and use the Translate button to get the output text in another box. It supports a maximum of 5000 characters for input text. So, you need to keep this in mind before you try to add a long text. The output comes good but for some words, it wasn’t able to provide the output, and the original text was visible in the output. But, overall the results were good. Also, it also provides a separate box where you can see translation of each word separately. 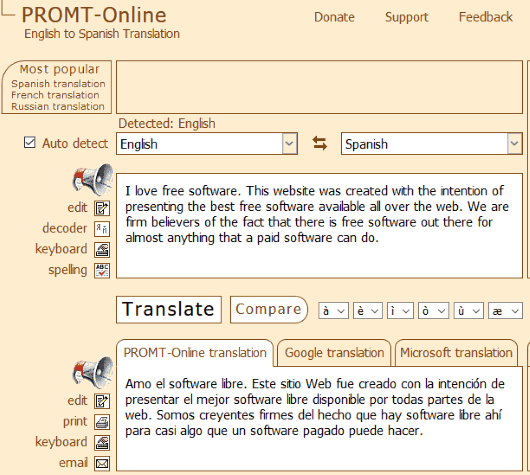 Free Translation Online (Homepage) brings a simple interface but the translated text comes very good. You can set input and output languages, add the text for translation, and get the result. The output text is visible in the separate box. 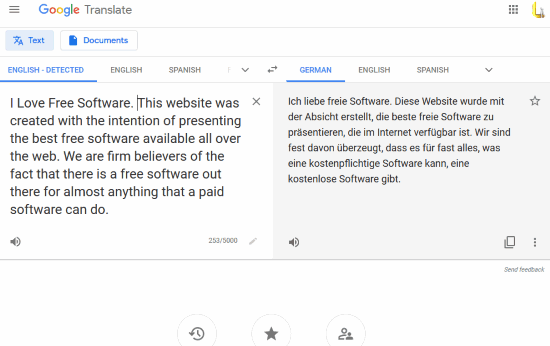 The feature that I like about this website is it brings its own text translator and also lets you use Google Translation and Microsoft Translation with different tabs on the same interface. So, if the output of this website doesn’t come as expected, then you can check Google and Microsoft Translations. There is also a spell checker but that is not very useful. Also, there is an option to translate and speak and the input text but for that, it prompts you to install some add-on for Firefox browser. 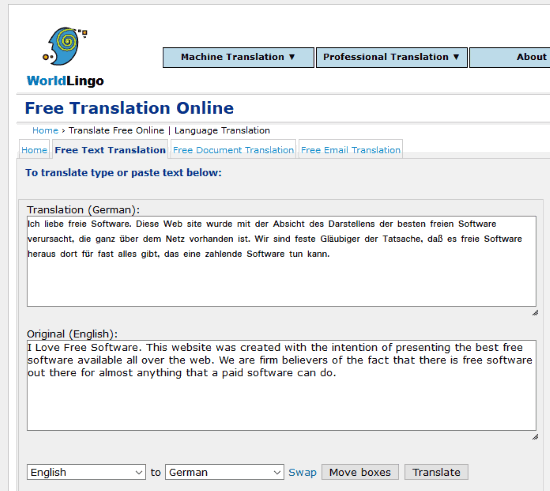 Translate Free Online (by WorldLingo) is another good website for text translation. Here is its homepage. The number of supported languages for text translation is limited (total 15 languages), but the translation feature is good. Set input and output languages and use Translate button. This will start the translation and show you translated and original languages in separate boxes. Just a straightforward feature and no other options. Translate.com (Homepage) is the last website on this list for online text translation. Its interface looks a bit similar to Google Translate where you can add original text and it will automatically detect the language. Once done, you can select translation language and get the output text. There is a Camera icon and Mic icon also available for translating speech into some other language, but these options didn’t work for me. But, text translation feature is good because it uses Microsoft Translator to provide the output. Here I close this list which has some very popular to lesser known but good online text translators. No doubt, Google Translate, Bing Microsoft Translator, and Google Docs have their own importance, other text translator websites are also good to try.